A set of pine antique collector's drawers. The cabinet has ten slim drawers with brass coloured handles. The drawers have dividers of differing sizes, for collected items, with the spaces getting larger further down the unit. The bottom drawer has no dividers. The cabinet has an apothecary style appearance and has a pretty colour and varnished finish. There are labels in the drawers from the original owner and this feature adds a great deal of character to the item. 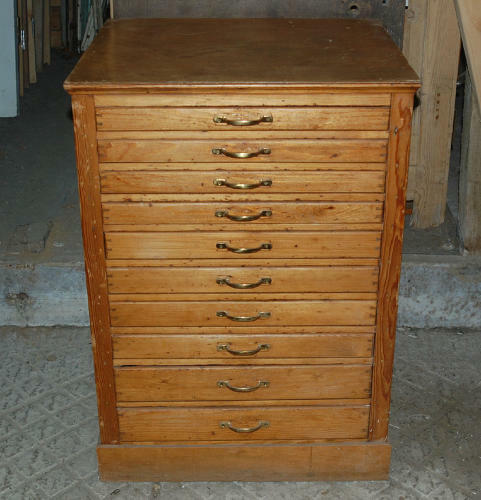 The drawers are in solid, useable condition, with each drawer free moving. The unit does have a replacement plywood top which we can replace with a reclaimed pine top for an EXTRA CHARGE of £50. Please contact us at the time of purchase if you would like this service. The present top has a knock and several scratches. The drawers have some marks, stains, discolouration and general signs of wear due to age. The drawers have an interesting look, fitting with the current fashion of apothecary style. An interesting and desirable item, with useable storage, that would be fantastic in a home or business.